The terrain pictured above is very similar and close to where the Betz Sphere was originally found. Photo courtesy of the Betz Family. Copyright 2019, Astonishing Legends, All Rights Reserved. – A Paraphrased exchange between Gerri and a Science Journalist and family friend who wrote an un-produced script about the Betz Sphere. Copy of Copy of The Betz family around the time of the sphere’s discovery. Terry is pictured far right, with mom Gerri to the left. 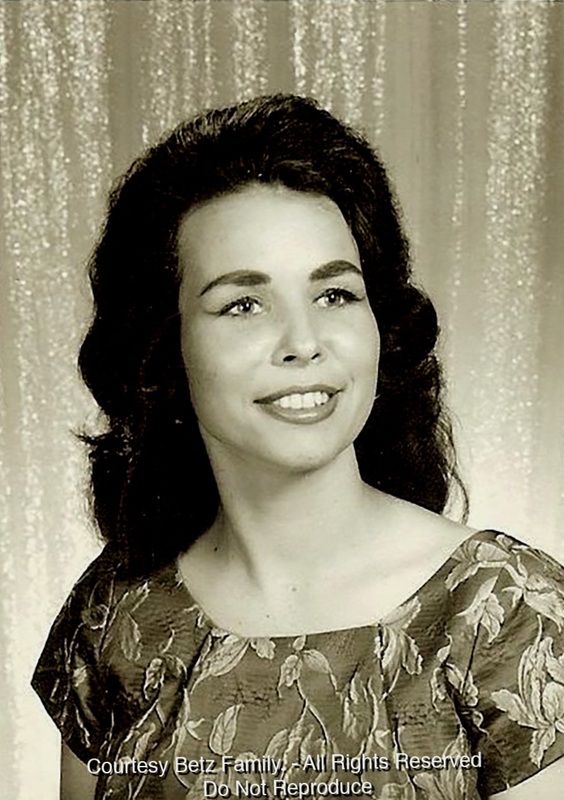 Gerri Betz at home. Image courtesy of the Betz family. All Rights Reserved – Do not reproduce. Gerri Betz. Image courtesy of the Betz family. All Rights Reserved – Do not reproduce. 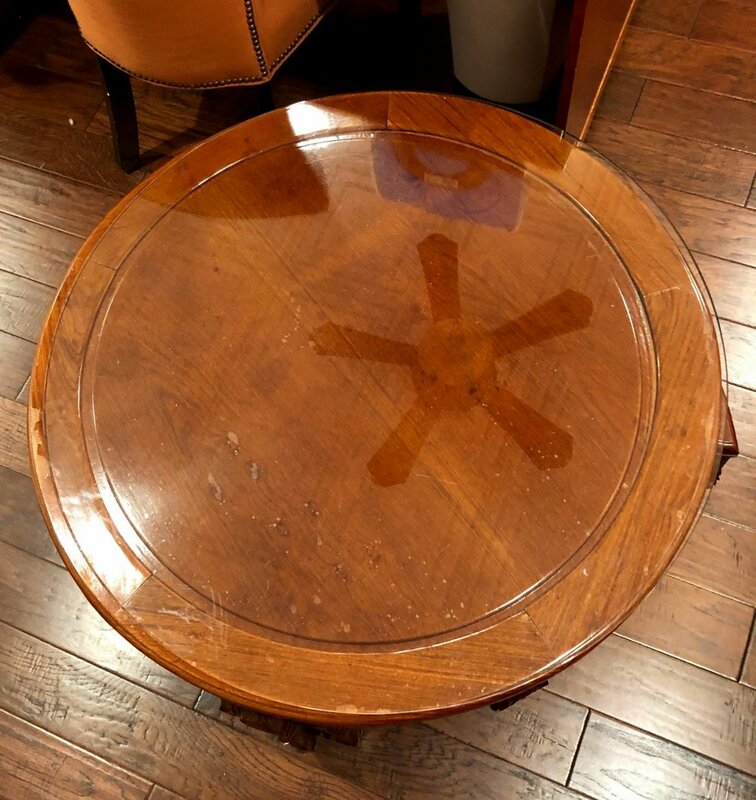 The coffee table that the sphere rolled around on, found the edges, but did not fall off. Image courtesy of the Betz family. All Rights Reserved – Do not reproduce. Image courtesy of the Betz family. All Rights Reserved – Do not reproduce. The family Station Wagon used to transport the sphere home. Image courtesy of the Betz family. All Rights Reserved – Do not reproduce. Image shows texture of the tile floor the sphere rolled around on. Courtesy of the Betz family, All Rights Reserved – Do not reproduce. Observation tower on the property. Image courtesy of the Betz family. All Rights Reserved – Do not reproduce. The approximate location where the Sphere was originally found in 1974. Note: the area in 1974 was largely unpopulated and undeveloped and has since seen significant growth. 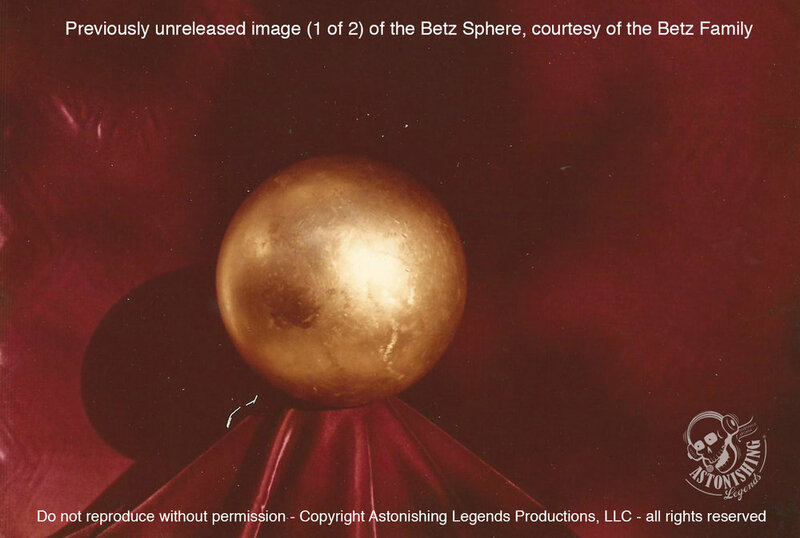 As we close this final chapter on the story of the Betz Sphere, we've all been given a rare and exclusive glimpse into what happens when an impossible object becomes known to the world. We've seen what can happen to a regular family that only sought to find answers about its purpose. We've seen how authorities and officials behave when they too are mystified about an item that most are satisfied to dismiss as discarded industrial junk; their public stance hiding personal and professional curiosity. We've seen how the news media tries to answer the questions we all have but falls short, leaving the real story untold and yet retold again and again with incorrect or incomplete information because that's all the public is allowed. Most importantly, we've all now seen inside this mystery but are once again reminded that when it comes to High Strangeness, the answers we receive we may not understand. 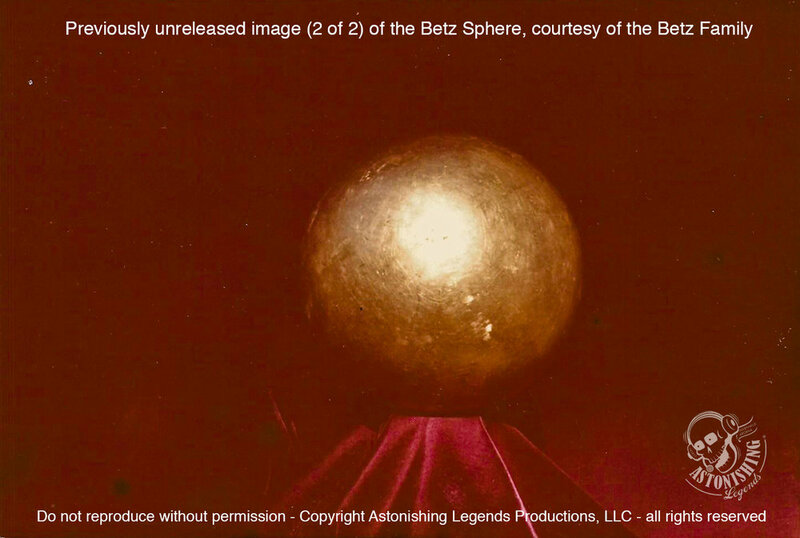 In the end, what we can safely conclude is that the Betz Sphere may or may not have come from an alien world, but it was evidently created in a secret place the populace is not allowed to know. After learning about all the otherworldly aspects of The Betz Sphere, you might be asking yourself, are we alone? Do aliens really exist? The existence of extraterrestrial life has captured our collective imagination for generations. Those who claim to have had encounters believe what they saw. But, what does the evidence show? Every week, the Parcast Network's new podcast Extraterrestrial examines these stories with a critical eye, analyzing possible scientific explanations and determining what really may have happened...and whether or not we are really alone. Consider this: the Pentagon spent over $100 million researching UFOs and have nothing to show for it. In fact, some might say they’re hiding something from us. Extraterrestrial will dig deep into the evidence to determine the truth. Do they really have something to hide? New episodes of Extraterrestrial come out every Tuesday. 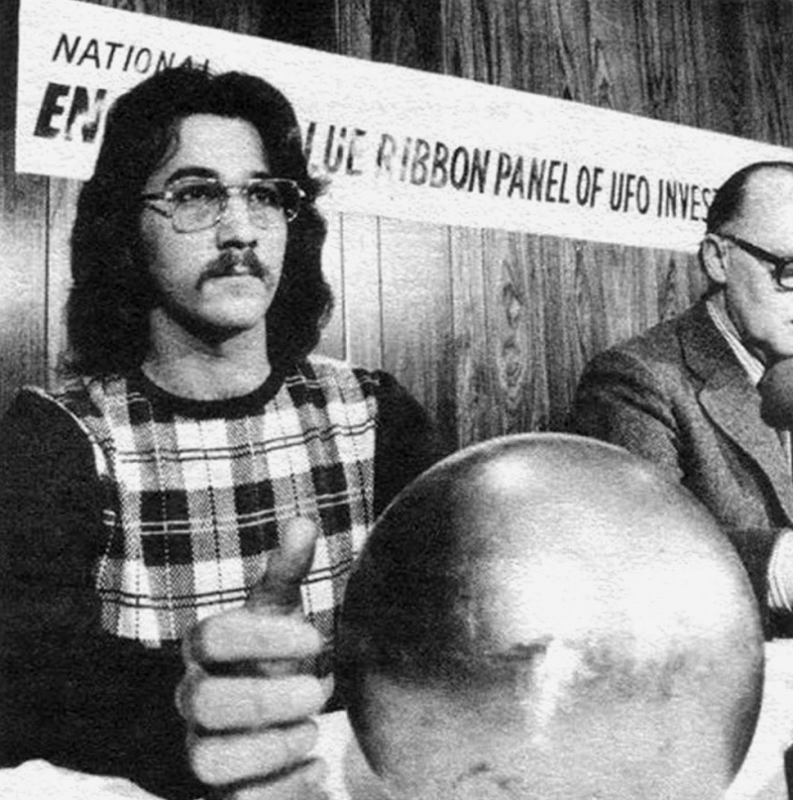 And look for upcoming episodes spotlighting “Reptilian Humanoids” and the 1977 UFO invasion in Fort Benning, Georgia! Search and subscribe to EXTRATERRESTRIAL wherever you listen to podcasts. Or visit www.parcast.com/extraterrestrial to start listening now! Have you ever been curious as to how law enforcement handles hostage negotiations? It’s often the last resort of the criminals, a super intense, down-to-the-wire standoff before a resolution, and there have been a lot of famous cases throughout history! Well, we’re all in luck, because the Parcast Network has a really interesting idea for a new podcast, it’s called HOSTAGE, where each episode of Hostage examines tactics used by the FBI’s crisis negotiation unit, as well as strategies used by world governments, and even the hostage’s parents, highlighting the moments where everything went tragically wrong as well as the techniques that miraculously saved lives. Parcast’s researchers and writers combine extensive fact digging and comprehensive storytelling, and that means Hostage the podcast brings you into the heart of the action, where the unique viewpoints of hostages, captors, and negotiators come together. Get a behind-the-scenes view of the negotiations hidden from the public eye, and the complex webs of movement needed to safely extract captives. Check out last week’s episode on the Munich Massacre. Make sure to subscribe so you don’t miss upcoming episodes on John McCain and The Siege at Waco. New episodes come out every Thursday. Visit Apple Podcasts, Spotify, Stitcher, GooglePlay, or wherever you listen to podcasts and search for HOSTAGE. Or visit Parcast.com/HOSTAGE to start listening now! Part of the inspiration for this series is Rob Morphy’s intriguing and comprehensive Blog article for the Betz Sphere on Mysterious Universe’s website. In addition to being a writer and all-around cool dude CryptoMonsterHunter, Rob is also an illustrator, graphic web designer, filmmaker and co-host of the Cryptonaut Podcast and The Earth’s Mightiest Bastards YouTube Channel (Strong language). Find Rob by clicking any of the links above, follow him on Twitter @rsmorphy and subscribe today! Betz house built for A. Atwater Kent? Calm – The New Year is upon us, and it’s that magical time when you set some ambitious goals, only to give up after two weeks. But, what if 2019 was all about slowing down and being mindful? Imagine how many goals you could accomplish then. That’s why we’re excited to partner with Calm, the #1 app to help you meditate, sleep, and relax. Practices like meditation and prioritizing sleep can leave you feeling more rested, so you have the energy to go out and achieve your goals. If you head to CALM.COM/AL, you’ll get 25% off a Calm Premium subscription, which includes hundreds of hours of programs including: Guided meditations on issues like anxiety, stress, and focus, including a brand new meditation each day called the Daily Calm, perfect to guide you in building a meditation habit. Sleep Stories, their bedtime stories for adults, designed to help you relax before you doze off. Head to the lavender fields of France with Stephen Fry or explore New Zealand with Jerome Flynn from Game of Thrones. For a limited time, go to Calm.com/AL to get 25% Off and unlimited access to ALL of Calm’s content today. Give yourself the gift of Calm this New Year’s. Seriously, it might change your life! Episode 133 The Betz Sphere Part 4. Produced by Scott Philbrook & Forrest Burgess; Audio Editing by Sarah Vorhees Wendel; Sound Design by Ryan McCullough; Tess Pfeifle, Producer and Lead Researcher; Research Support from the astonishing League of Astonishing Researchers, a.k.a. The Astonishing Research Corps, or "A.R.C." for short. Copyright 2019 Astonishing Legends Productions, LLC. All Rights Reserved. For 13 years, Earhart researcher Bill Snavely has been pursuing a lead that no other person in his field has considered. In that pursuit, he’s been the only one to find a fully intact aircraft that under strict comparison to Earhart’s Lockheed Electra 10E, seems to have no differences. Since he first appeared on our show in May of 2018, he has assembled a team of unparalleled experts that have been to Buka and returned with startling new information. Now that team aims to return as soon as possible. Our last episode with Bill. Support the next expedition to Buka. Episode post 133-bonus: A follow up to Bill Snavely’s team’s first expedition to Buka. Produced by Scott Philbrook & Forrest Burgess; Audio Editing by Sarah Vorhees Wendel; Sound Design by Ryan McCullough; Tess Pfeifle, Producer and Lead Researcher; Research Support from the astonishing League of Astonishing Researchers, a.k.a. The Astonishing Research Corps, or "A.R.C." for short. Copyright 2019 Astonishing Legends Productions, LLC. All Rights Reserved. “And all of a sudden a man grabbed her from behind around the neck. She fell off of the ottoman that she was sitting on and dropped the phone. She was screaming into the phone, "They're trying to get me! They're trying to get me!" – Paraphrased from our interview with a Betz family member, recounting an attack on Gerri Betz during the fervor surrounding the Betz Sphere. Copy of The Betz family around the time of the sphere’s discovery. Terry is pictured far right, with mom Gerri to the left. 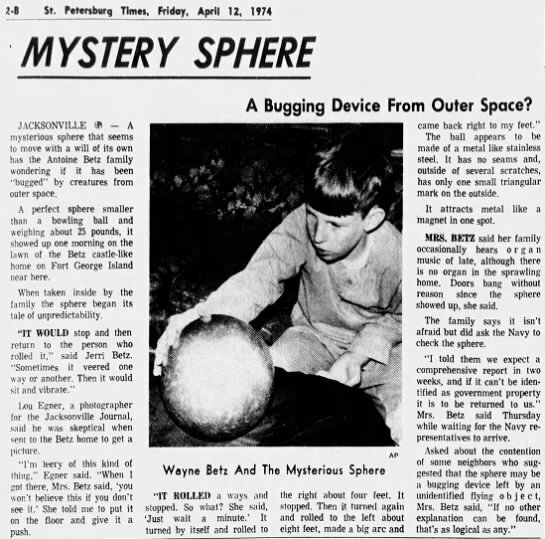 For something that many would claim was just a misplaced piece of industrial equipment, the Betz Sphere attracted a lot of serious attention, some official, some dubious and some a bit of both. Despite the initial vague or dismissive statements from the US Navy and noted scientists such as Dr. J. Allen Hynek that were reported by the news media, they were determined to continue seeking answers from it. The interest didn't stop with our government either, as mysterious foreign agents had shown up and expressed a keen interest in obtaining the orb. Subterfuge, manipulation both social and scientific, a disproportionate offer of a large sum of money, and even a possibly related assault all seem like a lot of effort to obtain an old discarded valve ball. 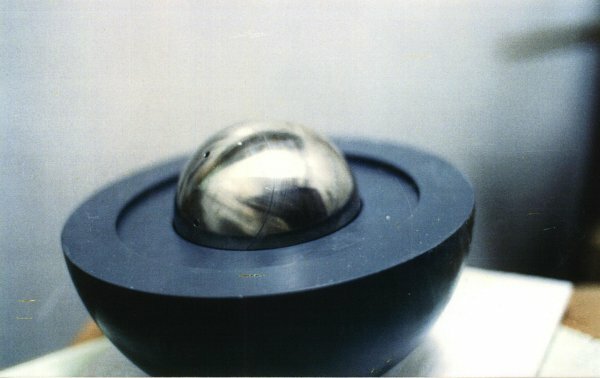 Episode 132: The Betz Sphere Part 3. Produced by Scott Philbrook & Forrest Burgess; Audio Editing by Sarah Vorhees Wendel; Sound Design by Ryan McCullough; Tess Pfeifle, Producer and Lead Researcher; Research Support from the astonishing League of Astonishing Researchers, a.k.a. The Astonishing Research Corps, or "A.R.C." for short. Copyright 2019 Astonishing Legends Productions, LLC. All Rights Reserved. 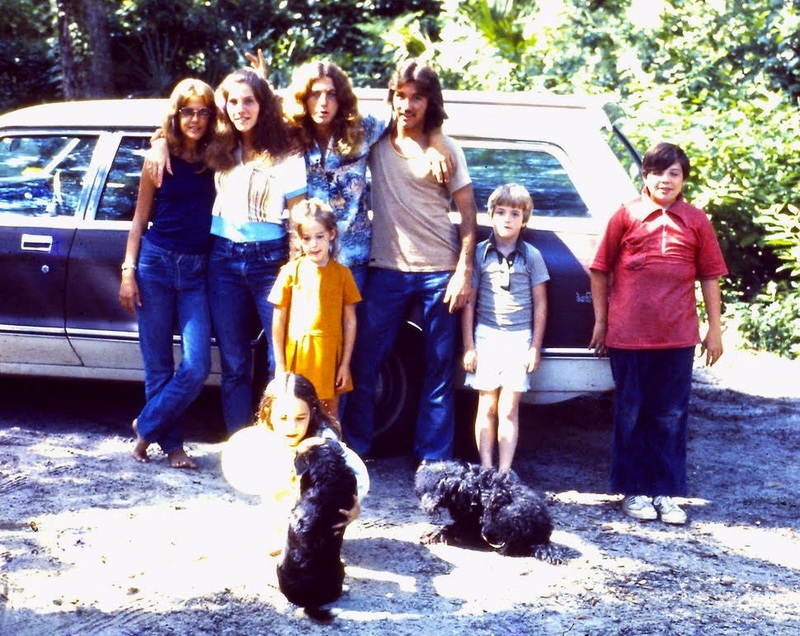 The Betz family around the time of the sphere’s discovery. Terry is pictured far right, with mom Gerri to the left. The coffee table that the sphere rolled around on, found the edges, but did fall off. Image courtesy of the Betz family. All Rights Reserved – Do not reproduce. The approximate location where the Sphere was originally found in 1974. Note: the land in 1974 was mostly unpopulated and undeveloped and has since seen significant growth. With every paranormal event or object, there are the questions of how did this happen or what was this thing? But the equally important issue is, how would this affect me? Because when something seemingly impossible happens, we have no context unless it had interaction with somebody. It becomes meaningful when we ponder the implications to our own human experience. 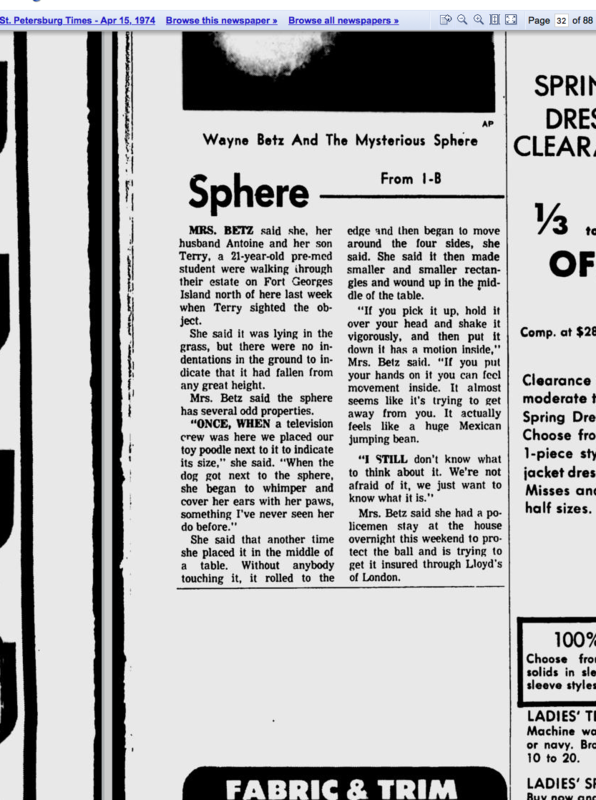 As much as the Betz Sphere created a scientific mystery it also created a family story. Tonight, we're fortunate to present an exclusive interview with a member of the Betz family who was there to witness the entire ordeal and who has generously agreed to share their family story and set the record straight. Someone or something secretive created this sphere and while its operation and purpose remain unknown to the public, how it became known to the world and how that affected their lives is their story alone. Mint Mobile – The “big” in big wireless provider stands for a lot of things — big contracts, big bills and big fees. Like AT&T's new $800 million "administrative fee" increase. What Big Wireless doesn't want you to know is that there’s a way to cut your wireless bill down to just $15 bucks a month... Introducing Mint Mobile, the game-changing company that’s taken everything wrong with big wireless and made it right. Use your own phone with any Mint Mobile plan. You can keep your old number along with all your existing contacts. Choose between 2, 5, or 10 gigabyte 4G LTE plans. No more paying for unlimited data that you’ll never use. Every plan comes with unlimited talk & text! And if you’re not 100% satisfied, Mint Mobile has you covered with their 7-day money back guarantee. Ditch your old wireless bill and start saving with Mint Mobile. To get your new wireless plan for just $15 bucks a month, plus FREE SHIPPING on your Mint Mobile SIM Card, go to MintMobile.com/AL. Episode 131: The Betz Sphere Part 2. Produced by Scott Philbrook & Forrest Burgess; Audio Editing by Sarah Vorhees Wendel; Sound Design by Ryan McCullough; Tess Pfeifle, Producer and Lead Researcher; Research Support from the astonishing League of Astonishing Researchers, a.k.a. The Astonishing Research Corps, or "A.R.C." for short. Copyright 2019 Astonishing Legends Productions, LLC. All Rights Reserved.